I kegged up my edwort's Apfelwein today and here are the numbers 1.066 OG and 0.998 FG. After taking the gravity readings I "sampled" the Apfelwein and it reminds me of a brut champagne. It will be interesting to see what its like cold and carbonated! Hmmm.... what to brew next! 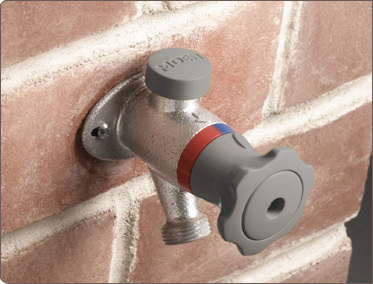 A Moen Hot/Cold hose bib! I installed one at the rental house I used to live at without asking to make washing cars and the dogs a lot nicer! I have been wanting one for a while now at this house with having a dog and boys that play in the mud. Sure would make washing brewing equipment outside simple! I'm reading up on all-grain today. Need a cooler, and a bigger boil kettle. Going to work on finding a keg to convert to a electric kettle. There's more of an investment for all-grain but its amazing how much cheaper the ingredients are! Once you get those then you'll be looking for a mill and bulk grain storage.........and so on and so on. Funny, I've been searching craigslist the past few days for a keg to do the very same. Right now I have a 5 gallon ALUMINUM turkey fryer. 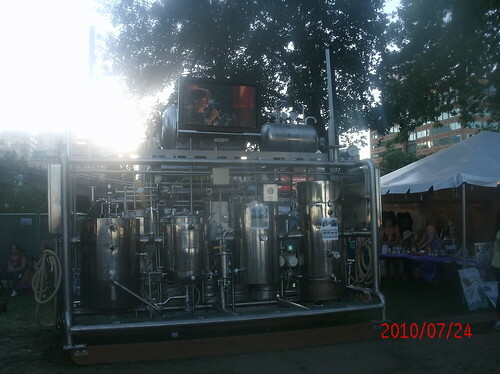 I want steel, and I saw on homebrewtalk.com that people have converted kegs into boil kettles. I saw on homebrewtalk.com that people have converted kegs into boil kettles. I have both a 1/4 and a 1/2 keg converted into boil kettles. Just need to get my burner when its in stock again at my LHBS. There's a bunch of them on CL right now for <$50. I have about 3 weeks till I can brew another batch. I'm only 5 days into primary fermentation, but I'd like to have one set up for the 2nd batch. that looks like some serious research. More like that looks like some serious $$$$$$$$$$$$$$$$$$! At that point when its all automated doesn't it kind of take away the whole fun of brewing? I might make one of these just for a solid workbench in my garage. I like the exposed bolts. Yeah its a nice bench! I built a bench almost identical to that with some Ipe wood for a friend with a Big Green Egg. 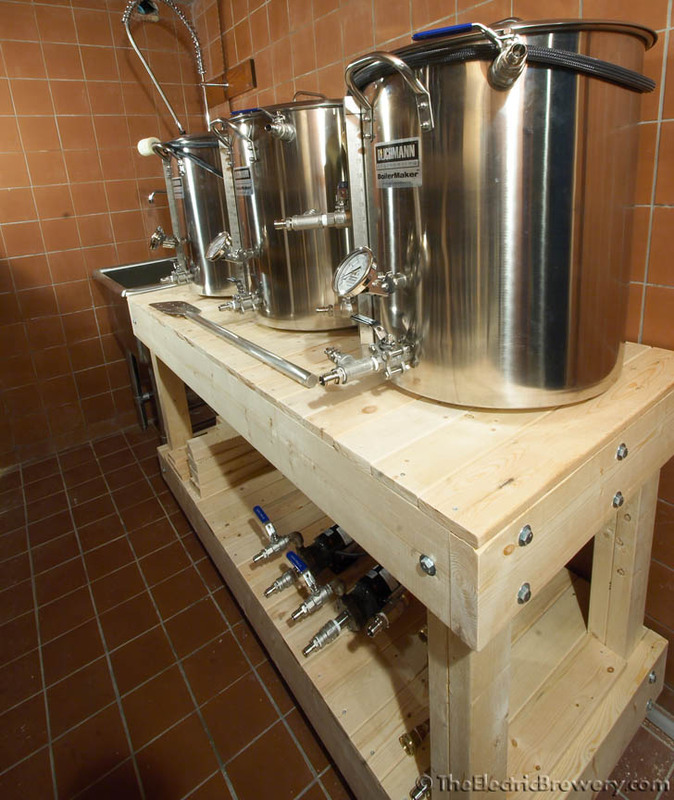 bunch of money in that setup, the brew kettles (before modifications) alone are $400 EACH! literally my favorite thread automatically. Ive done a couple batches when I was in college with my friend but never got the chance to buy my own stuff. I'm gonna bite the bullet on a kit pretty soon and start brewing. so excited! I'm gonna bite the bullet on a kit pretty soon and start brewing. so excited! Also check your area and go check out your LHBS (local home brew store). Yeah that's a cool thread.... spent many hours in there! I'm still undecided if I want a "sculpture" because they just take up a bunch of space. also, the Nut Brown Ale has slowed down to ~1 bubble every 5 seconds, and, I am tempted to hook up that keg of stout and see how it's coming along.